One of my favorite things about working on my sky scarf is the opportunity to add in some beads! (Wondering what a sky scarf is? You can learn more about it in my post here.) I am using blue beads on rainy days and white beads on snowy days, and I have to admit it is definitely a silver lining on those gray and dreary days. 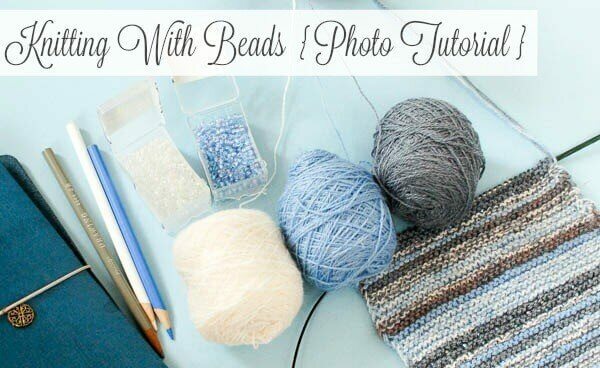 Since I have had a few questions on how to do this, I thought I would put together a little photo tutorial on knitting with beads. Pick out beads that complement your project and suit the yarn weight you are using. You want the beads to have an opening large enough that your yarn will fit through. For my sky scarf I am using double strands of lace weight yarn so 6/0 seed beads are perfect. I have also used this size bead with sport weight and DK weight yarn with no issues. 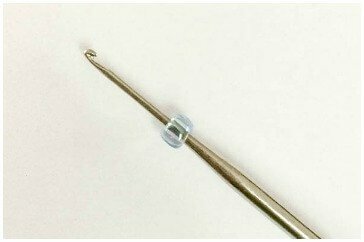 Next you want to find a crochet hook that fits through the bead opening. I find a steel US 6/1.6 mm hook works great. When you get to the point in your project where you want to add a bead, put a bead onto your hook. From your project, slip the next stitch from your left needle onto the crochet hook. With your finger, push the bead off of the hook and onto the stitch. Then slip the stitch back onto your left needle. Now knit the stitch as usual. That’s it! You have now added a bead to your row. Repeat this for each stitch that you would like to add a bead. Thanks for sharing. I didn’t know it could be this easy! This is really lovely! What a great accent. I love that you don’t have to add all the beads on to the yarn at the beginning! Thanks for the tutorial. I wasn’t sure how you’d go about adding beads when knitting. It certainly is simple. Is there any way you are able to decrease the ads on your blog? It is quite distracting and bothersome, especially when the ads cover the content of the post. I’ve noticed ads on a number of WordPress blogs recently. Do bloggers not have a choice as to whether ads are added? Just curious, since you didn’t have ads on your posts in the past.